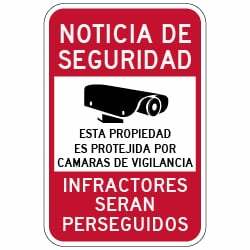 In many parts of the country Spanish is widely spoken and using one of our Spanish or Bilingual No Trespassing signs can be essential for getting your message across. Our durable aluminum and reflective signs will be working for you 24/7 and helping to keep your property, and those with your permission to use it, safe from the annoying and sometimes criminal acts of trespassers. This popular Spanish Property Protected Sign is also available in 18x24 size. DOUBLE the working life of your Spanish Property Protected By Video Surveillance Signs by adding 3M Protective Overlay Film (POF)! 3M’s high-tech POF protects sign faces against fading caused by the sun and harsh weather—and makes graffiti and sticker defacement damage easy to clear away without harsh abrasives.